Many of you that have been following YARNutopia for a while now, are acquainted with our page mascot and resident mischief maker, Shenanigans™. Shenanigans™ lives up to his namesake through his daily antics and his trouble-making ways. Similar to a Sour Patch Kid, he is sometimes sour, and sometimes sweet, and his personality has transpired remarkably to fit both of these characteristics. His cute and cuddly looks are his only redemption from otherwise questionable behavior, but Shenanigans™ will win your heart over every single time with that face and spongy tummy. In 2014, I decided to create a page mascot as part of my YARNutopia brand – a character for social media. Derived from my sense of adventure, that was often contained by long hospitalizations, I decided that this character would embody everything that I wish I could do but couldn’t because of my health. I wanted to instill a sense of silliness, sass, curiosity, and a naughty streak for finding himself in interesting and humorous situations. My character started to take on a life and personality of its own. Immediately, I knew this had to be a little sheep – the perfect symbol of YARNutopia. 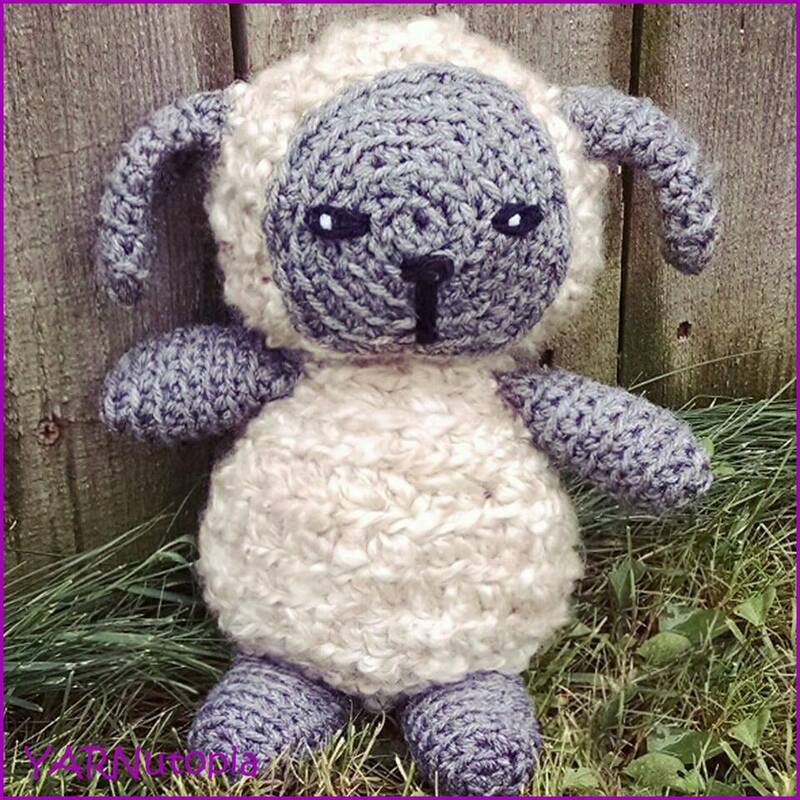 I found this pattern by Harugurumi and created our darling YARNutopia mascot from Lion Brand Homespun Yarn and a face filled with character. Soon this little guy took shape and I knew he would be loved by all! As I was crocheting this pattern, it occurred to me that this is probably what Gepetto must have felt like creating Pinocchio. HA!! Shenanigans™ was given his name on September 5th, 2014, and he became social media official. He began a life of adventure and mishaps galore when he joined me as a persona for YARNutopia. He has been my crochet sidekick for a long time now. He has accompanied me at many hospital stays and doctor visits since he was created. It has helped to have him along as a way to take my mind off of long hours spent sick. He has traveled many places on this planet. It has been fun to think of misadventures for him and orchestrate the scenarios he has found himself in, which I have documented in photographs for social media. He has been a character in my crochet story. Many YARNutopians have asked about him wanting to make their own. I used a pattern from another designer, as I mentioned earlier, and can only guide everyone to their page and a link to tips on reading patterns here so you can make your own version of Shenanigans™. Shenanigans™ will pop up from time to time on our Facebook and Instagram, so feel free to suggest adventurous ideas for him to explore!